Institutional investors assume certain responsibilities in the exercising of their participation rights. Institutional investors are to exercise their participation rights insofar as this is deemed appropriate and feasible in the interests of their clients. Institutional investors shall take due account of the interests of their clients when exercising their participation rights. Institutional investors shall assume responsibility for exercising the participation rights to which they are entitled. Institutional investors shall communicate the principles and processes involved in exercising their participation rights to their clients. Once a year, institutional investors shall disclose the manner in which they have exercised their participation rights. 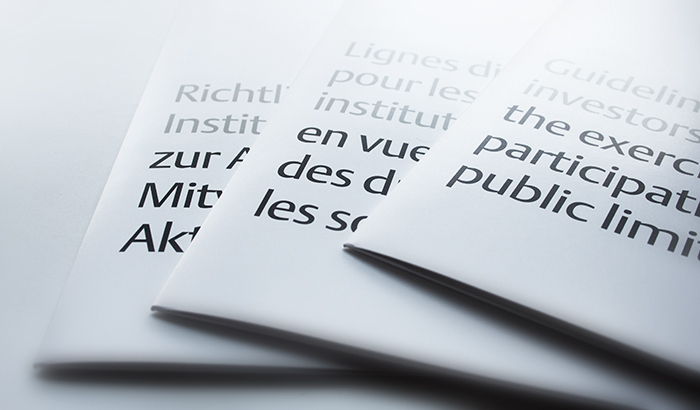 These guidelines govern the exercising of participation rights in Swiss listed companies. However, some of the principles may also be applied where appropriate as the basis for the exercising of participation rights in foreign or non-listed companies or organisations (including those with a legal form other than that of public limited company). Institutional investors have to be fully aware of their particular responsibility towards their clients and respect their important role in ensuring long-term, effective corporate governance of the companies in which they hold equity securities. They shall exercise their participation rights diligently and in the interests of their clients. The authors of these Guidelines have formulated the following five basic principles with this in mind. Institutional investors who agree to abide by these Guidelines are required to either fully comply with these formulated principles or explain in a statement of accountability on their website why they deviate from one or more of them (“comply or explain”). It is deemed appropriate for institutional investors to exercise their participation rights if the associated expenditure is justifiable and reasonable from the point of view of adequately safeguarding the interests of their clients. In particular, the exercising of participation rights includes entry in the share register as a shareholder with voting rights and the exercising of voting rights at the general meeting of shareholders. Institutional investors are required to specify the circumstances under which loaned equity securities (“securities lending”) are to be recalled for the exercising of their participation rights. Participation rights shall be exercised in the interests of clients. In exercising these rights, institutional investors should adopt a long-term and sustainable approach, unless the relevant investment guidelines stipulate to the contrary. When exercising their participation rights, institutional investors shall take due account of the specific circumstances of each individual case and thus avoid the concept of “one size fits all”. In their investment guidelines, institutional investors are required to define the manner in which they exercise their participation rights. They may form their opinions in the course of appropriate dialogue with the involved companies, and if any controversial issues arise they should attempt to resolve them by contacting the companies concerned. Institutional investors are obliged to exercise their participation rights independently of any political criteria or instructions from third parties. Institutional investors should avoid any conflicts of interest. In the event of unavoidable conflicts of interest they shall disclose them and take the necessary action to overcome them. Institutional investors may not delegate their responsibility for their participation rights to third parties. This does not rule out the assignment of the exercising of voting rights within the scope of an asset management mandate, as long as the exercising of voting rights complies with the specified criteria. Institutional investors may also call on the services of proxy advisors. Institutional investors must select their voting rights representatives and proxy advisors with sufficient care and ensure that they receive appropriate instruction and are adequately supervised. Institutional investors must carefully consider the recommendations made by their proxy advisors with a critical eye, and in particular examine their recommendations in order to identify any potential conflicts of interest. They shall ensure that the proxy advisors duly disclose any conflicts of interest and take the necessary action. If any controversial issues should arise, the proxy advisors shall pass on their recommendations in advance to the companies concerned. Wherever possible, “securities lending” prior to a general meeting of shareholders should be avoided or suspended if there are any controversial items on the agenda that have to be voted on and which could be of relevance in terms of the client’s interests. The principles and processes involved in exercising institutional investors’ participation rights shall be disclosed in such a manner as to enable an effective review. Institutional investors are obliged to define the principles governing the exercising of their participation rights and voting rights (“guidelines concerning voting rights”), as well as the process by which the decision regarding the exercising of participation rights is reached (in the form of a written policy). The policy also has to stipulate whether and, if so, how institutional investors are to coordinate the exercising of their participation rights with other investors, and/or how they are to call on the services of proxy advisors. At least once a year, institutional investors are required to issue a report (in the form of an accountability statement) summarising the participation rights they have exercised. However, they do not have to disclose details regarding voting in individual cases. In the accountability statement, institutional investors are obliged to disclose the extent to which they may have assigned the exercising of their voting rights to asset managers or have called on the services of proxy advisors, and how the relevant relationships are structured. Third parties who entrust institutional investors with the fiduciary management of assets, including insured parties and/or beneficiaries in the case of pension schemes. Equity and book-entry securities which represent the right of participation in a company. Securities which involve participation rights (notably shares) are particularly relevant for these Guidelines. Investors who are entrusted with the mandate of holding equity securities for clients on a fiduciary basis. Rights which allow the shareholders to participate in company business, notably the right to participate in and vote at the general meeting of shareholders.